at our front door, originally uploaded by Clara’s Bell. Moil PS mosaic, originally uploaded by GeoWombats. Seen yesterday at the Tropical Garden Spectacular here in Darwin. 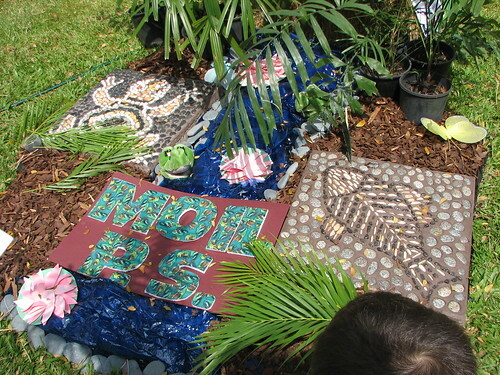 Someone at the Moil Primary School likes their pebble mosaics! 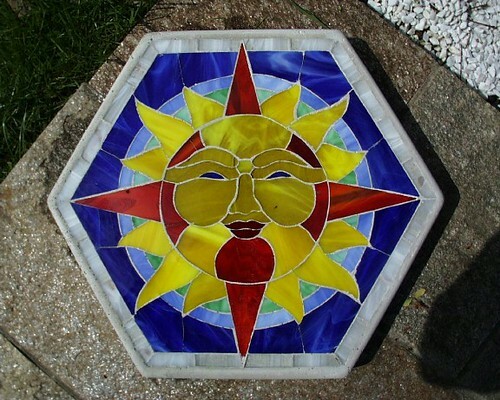 sun stepping stone, originally uploaded by midcitybrady. 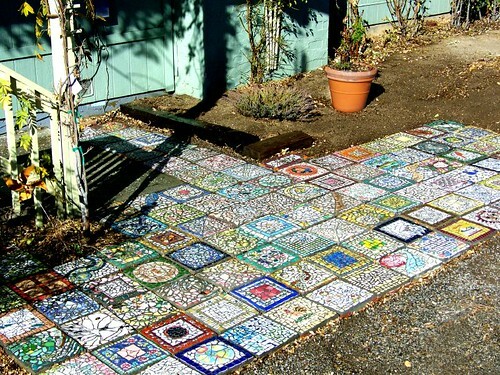 One of the best thing about mosaics is that if constructed properly, they are pretty hard to destroy. This one went through a couple of weeks of floodwater during Hurricane Katrina and has survived beautifully. 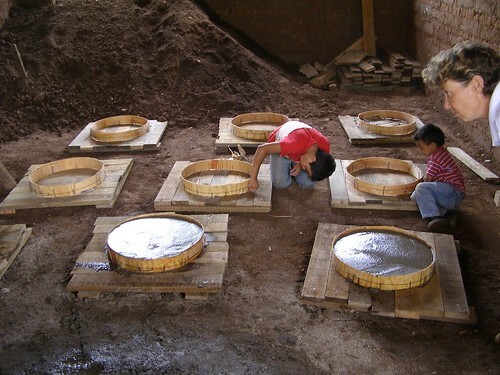 Better Homes and Gardens have a nice little stepping stone project at the above link. SUNSTONE, originally uploaded by cassandra204. Now where did that come from?! now where did that come from? !, originally uploaded by GeoWombats. I live in a part of Darwin where the overhead power calbes are all being undergrounded due to the cyclone risk. They have finished most of the digging and trench work along my street for now [Yay!] but the power poles still have to come down. 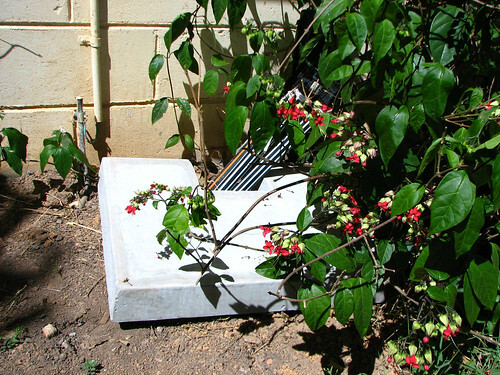 I was out with the camera and noticed that in the last week I seem to have acquired a brand new stepping stone type thing below my power box to protect the new cables. Anyone got any ideas for an electricity related them for a mosaic? How can I NOT attack that?!!!! 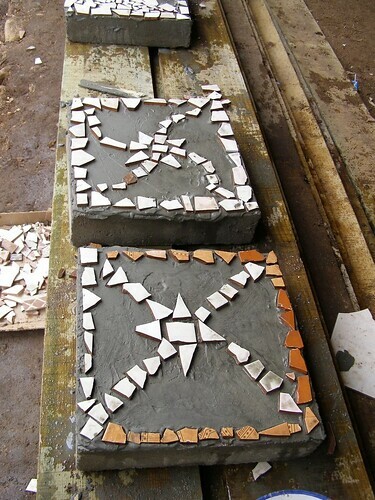 Mosaic molds, originally uploaded by Juniperberry. 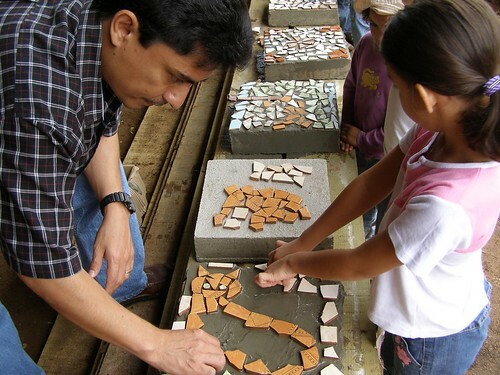 It’s Earth Week again this week and mosaics must be one of the one most eco-friendly arts around. It lasts forever, can reuse materials and makes our environment just that little bit more pleasant. Gato mosaic, originally uploaded by Juniperberry. 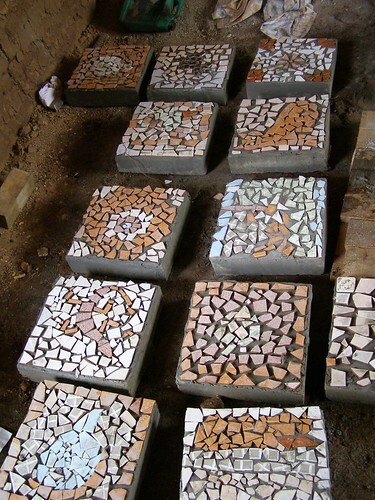 Making mosaics, originally uploaded by Juniperberry. 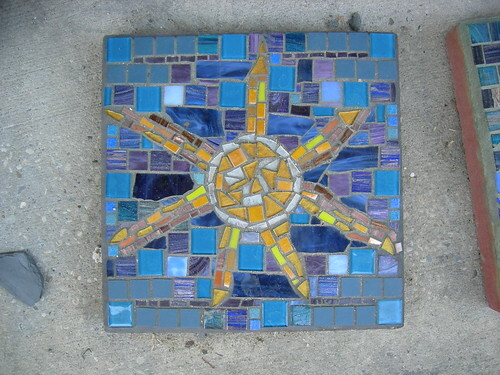 mosaics, originally uploaded by Juniperberry. 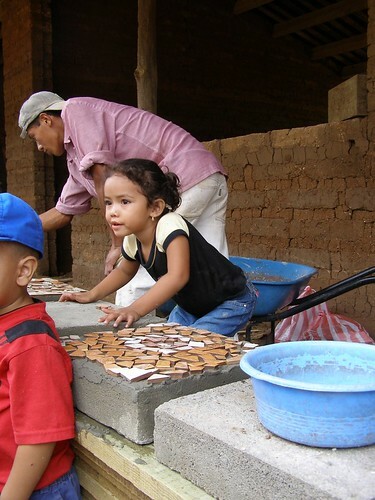 This is some people did in Villa Verde, Honduras. Made stepping stones for a path. So what are YOU going to do THIS year?